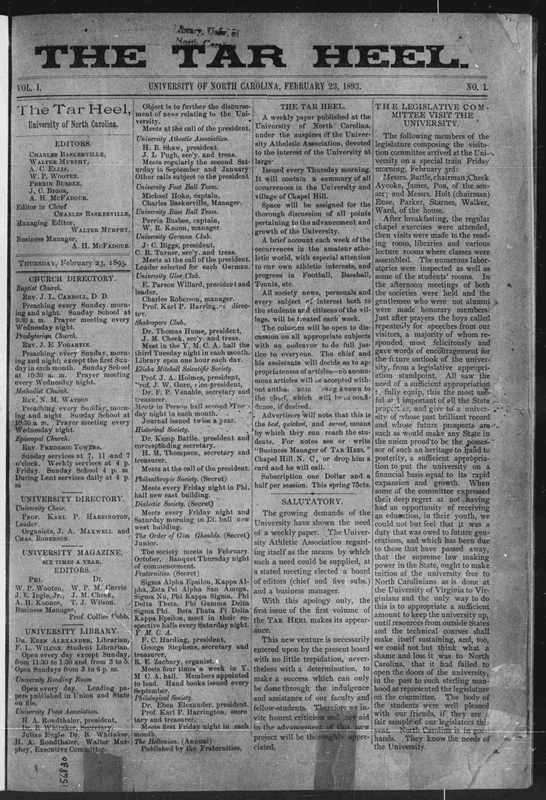 First page of the first Daily Tar Heel, Feb. 23, 1893. An exhibition at the Wilson Special Collections Library follows the 125-year history of the University of North Carolina at Chapel Hill’s student newspaper. “The Truth in Eight-Point Type: The Daily Tar Heel Celebrates 125 Years of Editorial Freedom” traces the paper’s history from its early focus on campus athletics to its current status as one of the nation’s leading collegiate newspapers. It complements the new history “Print News and Raise Hell: The Daily Tar Heel and the Evolution of a Modern University” by Kenneth Joel Zogry (UNC Press 2018). Linda Jacobson, keeper of the North Carolina Collection Gallery and the exhibition curator, said that the stories, photographs and artifacts on view will demonstrate the initiative and courage of the Daily Tar Heel’s student journalists throughout the years. “We’re focusing on notable events, especially those where editorial freedom has been challenged,” said Jacobson. The paper’s student journalists led campaigns against hazing in the early 1900s, against the early professionalization of collegiate sports in the 1950s and in favor of the Civil Rights Movement of the 1960s. The paper’s position frequently evoked criticism from certain student groups, alumni and North Carolina residents. 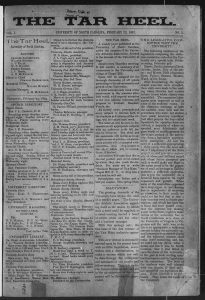 Some controversies challenged the paper’s very survival. The exhibition will also feature less controversial moments in the paper’s storied history. Visitors will be able to see the first issues of the Daily Tar Heel (then called simply the Tar Heel) and an original cartoon drawn by future Shoe cartoonist Jeff MacNelly. Staff at the University Libraries have worked closely with the Daily Tar Heel in the past to digitize issues of the paper through 1992 and present them online. Doug Wait, a volunteer who helped curate the exhibition, says it is a good reminder of just how much has changed in the last 125 years. “I think it will open people’s eyes to a lot of historical things that have happened since the Daily Tar Heel has been in existence,” Wait said.